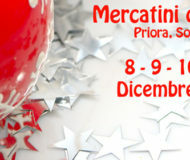 Priora (a little area of Sorrento) comes back to life in Christmas time, putting on the Christmas Market. Days of music, good food and, of course, full of many markets where you can find objects of any kind! Even this year this tradition is renewed and you can enjoy the flavors and creativity of these places from 8 until 11 of December, in conjunction with the Immaculate Conception festivity. The main attraction will be music, but great entertainment space will be given to children, to the numerous stands selling crafts, Christmas decorations, games and good food and, last but not least, the non profit initiatives. It is right to start your tour from this place, pointing out the “Market of the Immaculate in Priora”, created to donate to charity all the proceeds obtained in these four days. The music, however, will feature a wide variety: from folk-rock Catalana de La Rua on December 8, going 60-70 the revival of the POAM Small Orchestra crank the second day, 11 December with a performance of Peter’s Gospel Choir, a gospel group from Campania, renowned for the skill of its members and often honored with numerous awards. All this Christmas will be surrounded by good food, from roast chestnuts to mulled wine, you will be able to enjoy tasty treats such as zeppole (a local product with an excellent cream) or donuts, sipping hot chocolate in an atmosphere of happiness and pleasant feelings, you can’t absolutely let those night go away! Description: from 8 until 11 of December, in conjunction with the Immaculate Conception festivity you can enjoy the flavors and creativity of these places.